TSUBARA - a restored 90 year old Machiya -Elegant.Calm.Lovely- So close to Gion! Machiya Tubara is located in the Higashiyama area in Kyoto. There are sooo many sightseeing spots, famous historical places, temples and shrines in this Higashiyama area. And are many shops of Kiyomizu-pottery and neighbours are very friendly. And there are many kind of restaurants, easy eating places(Izakaya, Ramen, Yakitori restaurants...), Bars, local shops, convenience stores, good grocerry and public baths near the house. You can go to many places like that from Tsubara on foot. We can tell you some good restaurants and nice Maiko-san stage or some Japanese experiences (for ex. Ninja class, Making Japanese sweets class, Tea ceremony class, amazing Japanese massage parlor ...etc). Also we know good guides for sightseeing. The house is convenient for transportation(bus, train, taxi). We recommend using taxi from Kyoto station (10mins). Tsubara was over 90 year old Machiya(traditional Kyoto house), we lovely restored all possible to original style using antique fittings & materials by traditional craftsmanship. Tsubara has many Machiya's features ~'Doma' long Japanese corridor from the entrance to the garden, 'Hibukuro' open ceiling in the kitchen, old hand made window glasses, 'Koushi' window lattices...etc. And we prepared new comfortable equipments in it - air conditioning , internet, microwave, washing machine, IHcooker, clean comfortable Futon(Japanese bedding) ....more. Especially, we set up “Roten-buro” out-door bath tub(Shigaraki pottery made) and “Suikinkutsu” in the Tsuboniwa garden(small Kyoto garden)!! 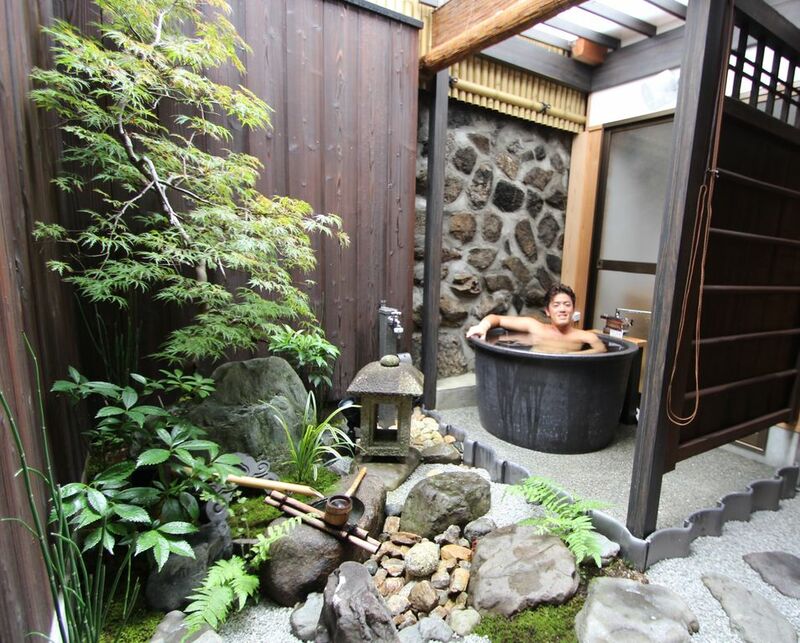 The out-door bath is great for tired bodies by sightseeing all of the seasons! You must feel like a hot spring! “Suikinkutsu” is a decoration device in a Japanese garden that generates a sound like the Koto-Japanese harp~with drops of water. You could have relaxed bath time hearing its sound! “Tsubara” is a very old Japanese word from “Manyousyu” (the oldest Waka poet collection over 1200years ago!). It means “enough” or “detail” or “calmly”. I thought it perfectly matches the house! Experience a fascinating, peaceful and amazing Kyoto stay in Tsubara ! Hi, my name is Koji, I'm Japanese. My family and I were born and grew up here in Kyoto. I like car, motorbike, eating, drinking, etc. My wife Eri likes eating Kyoto cuisine, seeing Kabuki, music(singing & listening soul music, Stones, Clapton...), Kimono, seeing Maiko-san&Geiko-San dance....of course we like, no, love Kyoto and traditional culture so much!!! We’d like to show you Kyoto’s great sights and introduce you delicious Kyoto restaurants! We're waiting for guests at check-in in the house, and we give them many information as we can. We hope our guests will have a fantastic days in my house in Kyoto. Although this machiya has gone by such a long time, it was been remained keeping quite original Machiya style. I thought I'll give it a new life as a guest house. You might be time travel to old Kyoto days!!! Out door bath tub(Shigaraki pottery made) in the tsuboniwa garden, functional shower room & clean toilet room(off course most-advanced high tech toilet with washer & warm seat). Small electric heater in dressing room. There are air conditionings in living room and bedroom. 2 gas heater in wooden floor room and kitchen. Small electric heater in a dressing room. We provide extra towels on no charge! Living room's table is Sunken seating. It's so comfortable. The microwave has a toast function. There is a table and 5 chairs in the wooden floor room. You can also use living room for dining room. Built in TV, and there are some DVD movies and Kyoto information. We have many Kyoto books and art books in Japanese and English. There are some books for children and babies! Example Japanese fairy-tale in English! And please play Origami (paper folding) with Origami books in English ! There is 'Tsuboniwa' traditional small Japanese garden with Suikinkutsu. The calm balcony overlooks Tsuboniwa. Special Out door Bath!! Also Pubic baths nearby. Enjoyed our stay, location was ideal, easy walk to some of Kyoto's most visit attractions, including the magical Gion district. The owners took a personal interest in making sure we were comfortable - the traditional home has been lovingly restored. Can't wait to return. We loved our 4 night stay at Tsubara. Eri’s assistance making reservations and her recommendations were spectacular and her home has been lovingly and meticulously restored with all the best amenities like a washer drier and high tech iron soaking tub. It is both in the heart of Kyoto near beautiful shrines and Gion and amazing food and shopping but a few short blocks make all the difference and the house itself is on a very peaceful stretch of homes. I wish we had stayed longer and we definitely will be returning to experience other seasons in Kyoto and staying at Tsubara. I can’t recommend it highly enough. Firstly I want to say how amazing the hosts are. Eri is so sweet and showed me around and gave me lots of information. Also before we arrived she had helped with restaurants, taxis and anything we asked for. The house is ideal. Old Japanese style, was perfect for our family of 4. Lots of amazing antiques and original glass sliding doors etc. the outside bath was a treat and used every night. We walked from the house most days but it was also easy to get a taxi from the end of the road. All in all it was perfect, comfortable bedding, great washer/dryer, coffee and basics provided. If you had small children it might not suit as the house is old. Beautiful historic Japanese home in a convenient location in Kyoto. We loved sleeping on futons/tatami mats. The kitchen was very functional. Neighborhood grocery store was excellent. Outdoor ofuro (hot tub) overlooking a traditional garden was incredible. The host met us at the house and clearly explained how everything worked. We had a lovely stay. Koji and Eri were very welcoming and helpful during our stay. Thank you so much for taking care of our family. the house is beautiful and everything is well thought out. We had a comfort stay as a family with two small children. The house is in walkable distance to the main attractions like kiyomizu temple and gion yet on a very quiet street. I highly recommend. The home was warm and the owners welcoming. It's a short walk to a supermarket, breakfast, and transit. 10/10 would stay again! Thank you very much for your staying. We’re so happy you had a good time at Tsubara! Yes, the house is located in so convenient place for sightseeing, shopping, eating and going other prefectures(Nara, Osaka, Himeji, Hiroshima and more). We’re looking forward to seeing you again. Machiya Tsubara is located in the Higashiyama area. And the house is close to Kyoto station. About 10mins by taxi. Or about 20mins by bus & 5mins walk from Kyoto station. Also there are so many famous & histrical places (Kiyomizu temple, Yasaka shrine, Gion district.....)close by. Of course you can go to there from Tsubara on foot ! * Minimum stay 1 night *Accommodation tax began in Kyoto city government for all lodging facilities from October 2018. Visitors who stay overnight in lodging facilities in Kyoto city must pay this tax to the accommodation. This accommondation tax is not included in rental cost of the house. Our rental cost per person per night is less than ¥ 20000, so the tax will be ¥ 200 per person per night. Please pay for the number of staying days by cash when your check in.